Hello, lovelies! Today I want to showcase my favorite products for getting tousled bedhead waves. 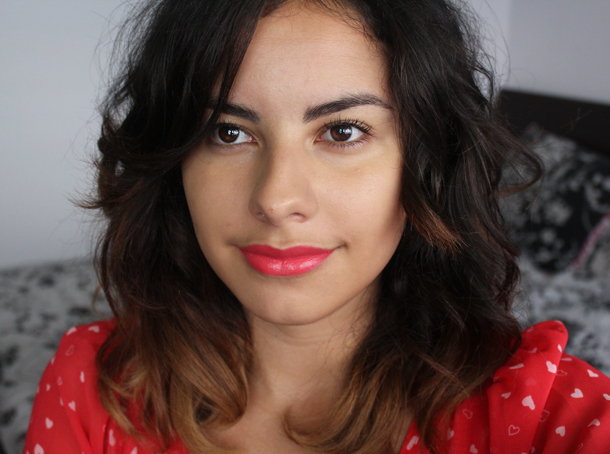 I love pairing messy waves with a bright lipsticks. I find that a bold lip color looks very “made up” so I like to pair it with unkempt hair during the daytime. The lip color I’m wearing is Fraise Remix from the Bourjois Rouge Edition line. I will have a review of this lipstick coming shorty. It was kindly sent to me by the lovely Latasha during our beauty swap. I like my waves to be very thick and loose, especially now that my hair is short. Actually, my hair has been short since I started blogging last October but before that I kept it long for years. I use the Jilbere Nano Silver Ceramic 1.5 inch Curling Iron. I got it for free with the purchase of a flat iron at Sally’s Beauty Supply years ago (don’t you just love holiday specials?) It’s a really good barrel. If it ever broke I would replace it immediately. I like running a bit of hair oil through my hair before curling it to keep it soft. I use a very small amount so my hair doesn’t get weighed down. I’m currently alternating between the Josie Maran Argan Oil and the original MoroccanOil treatment. I actually prefer the Moroccan Oil. It’s an expensive little bottle but I’ve had it for over a year and still have over half of it left. Let me know which are your favorite hair products for curly or wavy hair! I have quite naturally curly hair so I don't have to put a lot of effort in when I do a tousled look but I really love Aussie's Leave In Conditioner. I'm really interested in trying the Moroccan oil, it sounds so luxurious! 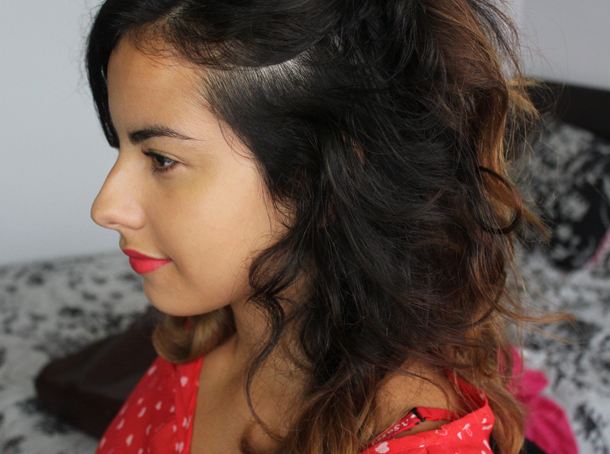 I love your hair and that's a great idea to pair red lipstick with messy waves. You look gorgeous as always. The lip colour looks so pretty. I rarely use curly products on my hair. I just use shampoo, conditioner, and then hair spray it most of the time. hello gorgeous! 🙂 your hairstlye is really pretty here! this oil looks like it makes miracles come true!haha need to get my hands on this! Oooh I love your messy waves! I've been trying to do the messy waves look but it just doesn't seem to look right on me. =( And my hair always goes back to being straight and lifeless after an hour or so. =( By the way, I love the shade of lipstick you are wearing, it looks great on you! Your hair looks amazing! The color, the length, the styling… everything is perfection! 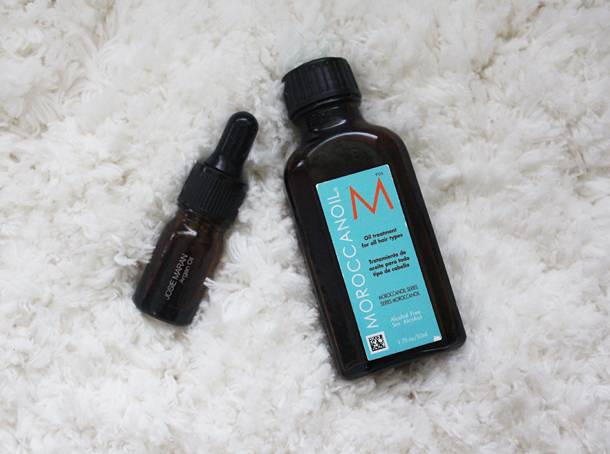 I'm loving moroccan oil as well; it's really transformed my hair after a slew of bad hair days! Ur hair is sososo pretty!! You're absolutely beautiful! Love your hair, love your makeup… as usual! Lol! You look beautiful as always!! I haven't been to your page in a while and the new layout looks really great! That lipstick looks gorgeous! Very summery look 🙂 I have Morrocanoil but I rarely use it – mainly because I never style my hair. I have cut it really short as well so I can't try out lovely waves like yours! You look gorgeous! I Love your eyebrows! Love the entire look! 😉 the color on your lips suits you veeeeery good!! !